"Don’t allow anyone to put limits on your dreams"
is born on the 9th of December 1974 in Johannesburg, South Africa. She loves South Africa, though her biggest passion "horseriding"
brought her in 2003 to Belgium. After a very traumatic car accident in October of 1998 Philippa became disabled. She lost all her strength in her right arm and 60% of the strength in her right leg. After a long revalidation nobody could stop her from riding. Before her accident she was planning to go to Germany to be trained on topdressagelevel. After her accident she had to learn from the beginning and this time with a severe handicap. She learned to ride again, but it was very though. Within a year she was back in the competition ring. Unfortunately being back in the ring made her a little brave. and lost her balance and fell. Unfortunately she broke her back. Again she had to recover and revalidate. In spite of all negative advice from her doctors, she started riding again. Philippa always says: "Don't allow anyone to put limits on your dreams". And she made her dreams come true. who helped her during the whole process, it worked. 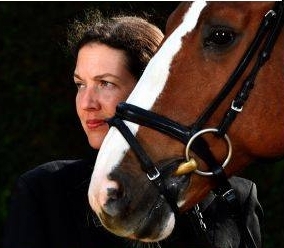 She became a successful international para-equestrian rider who competes at grade IV. to Belgium for an international para-equestrian competition in Moorsele. They came to Belgium and had to find horses for the team to ride at the competition. During their stay Philippa met Benedict, via Rutger van Werkhoven. At that stage the Hannovarian gelding was 9 years old. This was love at first site. She came to Belgium for Benedict but also because riding dressage at top level is more developed in Europe. The couple found in Belgium their current trainer Chris Haazen. From 2003 on Philippa and Benedict prepared for the Paralympics in Athens. Her dream: "To place in the first five finalists of the Paralympics in Athens" came true in 2004. Philippa made the decision to stay in Europe to prepare for Hong Kong 2008 together with Chris. She and Benedict did together a fantastic job at the olympics. They won the first equestrain gold medal ever for South Africa. South African history is also made because this is the first time that South Africa has sent a complete equestrian team to the Paralympics. Philippa has lived in Belgium now since 2002. Verdi and Lord Louis, while Benedict is enjoying his well deserved pension. Her goal is to ride at able bodied Grand Prix level in Europe. She’s doing really well on her way to get there. and Lord Louis is doing really well in the Prix St. Georges. Philippa represents South Africa in dressage. in dressage all over the world. She also found love in the arena. and together they train others in the sport. It took them about eight years after their first meeting to finally date. She thought he was married and he thought she was not interested. But eventually the pair found each other.